Wilderness at Hampstead Theatre. Photo: Tristram Kenton. Spending two hours watching a couple tear a relationship apart in front of their child, even an offstage child, is my equivalent of an icy cold shower in terms of entertainment. 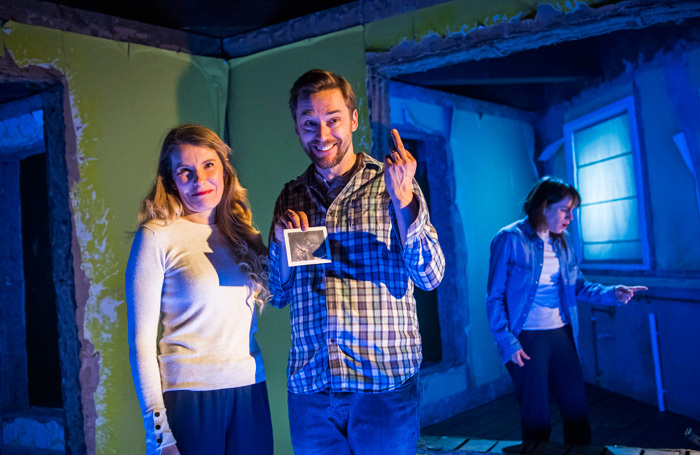 Yet Kellie Smith’s new play, Wilderness, an account of childhood blasted apart through acrimonious parental separation, finds a way of turning bleak material into drama that is painfully funny, even if at times veering towards the melodramatic. The first half is absorbing. Anne (Natalie Klamar) and Joe (Finlay Robertson) are splitting up. Their intention is to keep things amicable. After all, Anne and Joe may’ve fallen out of love, but their son is “a tree that can withstand any storm,” and he’s getting a “spaceman bed.” Predictably, despite the cool bedroom offer, things soon spiral out of control and Wilderness explores the breakdown of both parents as they desperately cling to their little boy in an emotional tug of war. Alistair, the boy, is not in the play. Anne and Joe speak out to the audience as if the child is propped up in the stalls. It takes a couple of minutes to adjust and then we are actively pulled into the couple’s brutal fight for their son, like being the jury in their court-case. It clearly focuses the action around the boy swamped by adult emotion. It also allows space for the audience to create their own version of Alistair. Anne Ledwich’s production brilliantly locates the drama in Lucy Sierra’s atmospheric set that resembles a burnt out shelter, a metaphorical war zone where two walls with two giant circular holes drilled out creates the impression of multiple rooms, like the layers of confusion played out within the decrepit paint peeling walls. Powerful motifs like Alistair’s suitcase are tinged with sadness, emblematic of neutral territory between two enemy camps. Anne finds herself in a perpetual state of packing and unpacking, as her son’s belongings become the object of intense scrutiny, literally, emotional baggage. Through neatly folded clothes and notes of communication attached to the inside of the case, Anne can access a world that she is no longer part of. Scrunching up her face, hands to head, she asks her son if clothes are washed, homework done, erupting volcanoes complete? It’s an exhausting tirade of aggressive demands as Anne starts to flag under the weight of being a single mum. Luckily, the easiness of dialogue propels the play forward and Smith’s writing is strongest when firing out witty one-liners, taking delight in smaller mundane details, detracting from the gloomy predicament. There’s Anne and her meddling neighbour who commends her on her single mother status. Then the blossoming romance between Joe and his shiny new girlfriend, Stephanie (Allison McKenzie) helps to lighten the mood. Overall though, the focus is on the parents as an almighty destructive force in Alistair’s life, especially Anne, who never stops for a second in her jittery, overprotective single mum status, racing about the stage with speedy nervous energy. From the outset, her shaking, twitching and scratching is more of an irritant, verging on the farcical, than tragic. Klamar navigates comedy well, dropping her tone for a split second, before rising up again to heightened levels of hysteria, but it’s not enough to sustain any depth of character and the production may have benefitted from a movement director to modify physical gearshifts. Here lies the problem with the play. Joe and Anne just spend too much time shouting at us and once the level of drama rises to boiling point, it stays there for too long to remain believable and never quite comes off the hob. Things get increasingly messy and once the play hurtles along beyond the halfway mark, both parents come across as so suffocating and shambolic, it’s hard to feel much sympathy for either. It’s a marvel that Alistair hasn’t already been whipped into care by social services. While Anne muffles her screams, banging her against the set, Joe abducts his son to his man cave, a wilderness shelter, scaring him so much he no longer wants to see his dad. By this point, the hysteria just needs to end. It eventually does in the form of forgiveness from both but, by then, it’s hard to care what happens to any of them as it all feels a little overblown. Wilderness is on at Hampstead Theatre till 27th April. More info here.